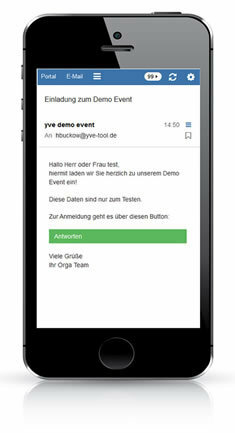 With our event softeware you can create your event an individual website with your design - completely ad-free. You can edit content freely, insert images or change color without the need for IT skills. Each event has its own questionnaire, which allows you to query the participation and any additional information - eg hotel rooms or workshops. All questions can be assigned with quotas. You can invite attendees with our event software to a invite only or a public event by email or letters. Pricing for our event software starts at 299 euro per event or 59 EUR per month (excl. VAT). Prices depend on the number of active events, the number of participants with registration management.